What Is the Scandinavian Food Lutefisk? Lutefisk is a Scandinavian food tradition that was imported to the United States. As a Christmas delicacy, it is even more popular in the U.S. than it is in the Scandinavian countries of Denmark, Sweden, Norway, and Finland. 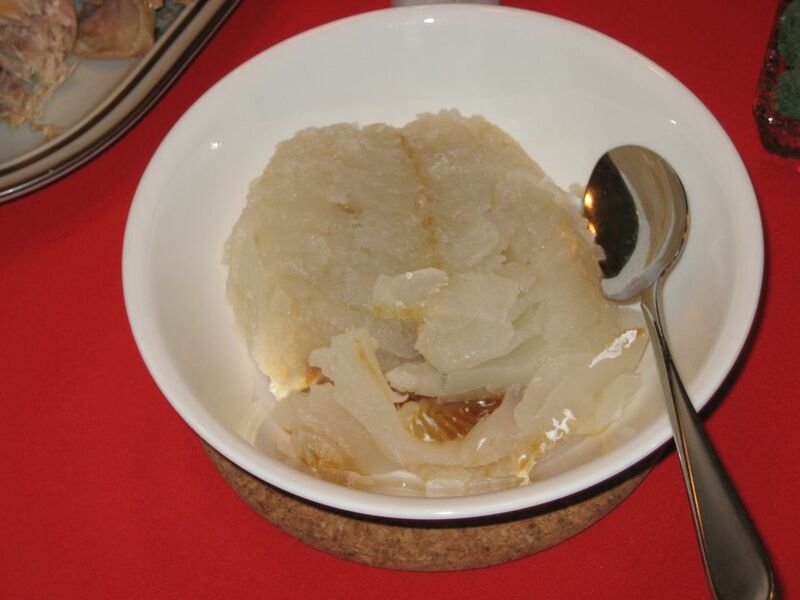 Literally meaning "lye fish," lutefisk is a dried stockfish (normally cod or ling, but haddock and pollock can also be used) that has been brined in lye, soaked to remove the resulting caustic solution, and then steamed until it flakes. It still looks and feels gelatinous. It is typically served with a warm cream or butter sauce and enjoyed with copious amounts of beer or aquavit. It is called lutefisk or lutfisk (in Norwegian and Swedish), ludefisk (in Danish), and lipeäkala (in Finnish). How Did It Become a Dish? In other regions, salting was the method used to preserve fish, but Scandinavia lacks major salt deposits. For millennia, drying was the best process to preserve whitefish in Scandinavia. Stockfish is very nutrient-rich, and you can assume that dried stockfish was was consumed domestically in the region. There was a boom in the dried stockfish trade in the late Middle Ages, and the product became accessible throughout Scandinavia, as well as the rest of Europe. During the time, historian Olaus Magnus, who lived during the first half of the 1500s and wrote "The History of the Nordic People." It is believed that lutefisk became a Christmas tradition as a result of the Catholic restriction of meats while fasting on various designated days and weeks. Fish and porridge were the substitution foods. During the four Advent weeks preceding Christmas, dry fish was most available and became the Christmas fish out of circumstance. Madison, Minnesota has dubbed itself the "Lutefisk Capital of the World" as well as claiming the largest per capita consumption of lutefisk in Minnesota. St. Olaf College in Northfield, Minnesota, serves lutefisk during their Christmas festival concerts. Lutefisk is also consumed in Canada because of its relatively large Scandinavian population, particularly in Western Canada. There are more than one million Canadians with immediate Scandinavian ancestry. Kingman, Alberta proclaims itself on its greeting sign to be the "Lutefisk Capital of Alberta." The lutefisk tradition in the U.S. has gotten to the point in the U.S., that there is a novelty folksong by American artist Red Strangeland sung to the tune of "O Tannenbaum:"
O lutefisk, O lutefisk, you put me in a coma." Salt cod is similar in concept lutefisk, although, in Scandinavia, the fish isn't salted. It is called baccala in Italian, bacalao in Spanish, bacalhau in Portuguese, morue in French. Salt cod is nothing more than codfish fillets that have been cured in salt and then dried. Another major difference is that the salt cod is not reconstituted in lye.